The food we eat every day is the product of the world’s largest production line: the global agri-food complex. Food is being grown, harvested, processed, packaged, transported, marketed, sold, cooked or prepared, consumed, and disposed of. Along the food value chain, inputs are needed, for example land, agro-chemicals, labour, water, machinery and energy, knowledge and capital. At the same time, outputs such as greenhouse gas (GHG) emissions, agricultural wastes and wastewater are generated. About 1.5 billion hectares of land are used for crop production (arable land), while an additional 3.4 billion hectares of non-arable land are used to pasture animals. The total area of agricultural land represents 38% of the earth’s terrestrial surface (and almost 50% of its vegetated area). Agriculture is particularly water-intensive relative to all other economic activities, and FAO estimates that it is responsible for 69% of global freshwater withdrawals. 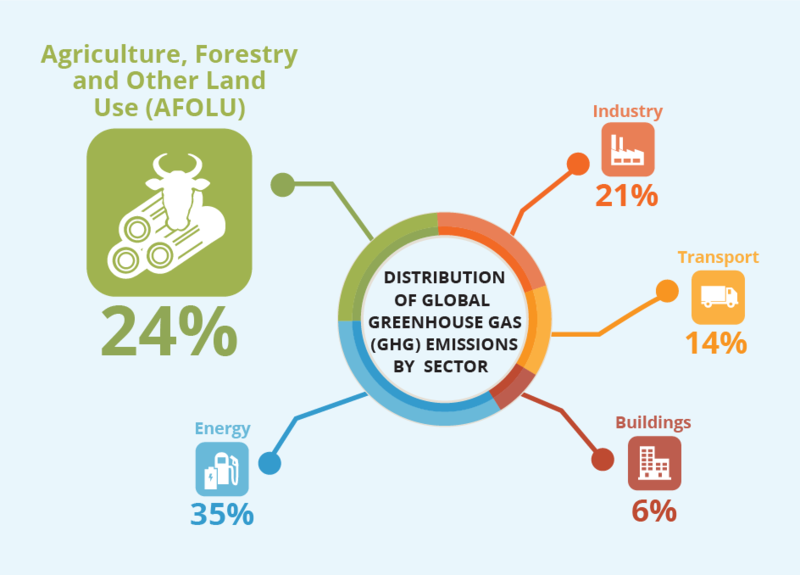 The way we use land for food, forestry and other purposes contributes about 24%—or approximately 12 billion tons—of our total annual greenhouse gas emissions. That is the second largest source of climate pollution after energy. To limit warming to 1.5 °C requires substantial mitigation actions, especially from the land use sector which involves agriculture, forests, wetlands, diets and food systems. We lose 7.6 million hectares of forests every year to livestock and agricultural expansion, unsustainable infrastructure, and resource extraction. That is the equivalent of 27 football pitches every minute. Food waste contributes more than 4 billion tons of greenhouse gas emissions each year. It takes about 14 million square kilometers of land – the size of China and the European Union combined – to produce all the food that’s lost and wasted, and this ecological footprint of ours is encroaching upon forests, peatlands, and other vital ecosystems. At a time when millions of people are facing food insecurity across the globe, we simply cannot afford to be this inefficient. If we cut waste, reduce excess consumption, and improve efficiency in our production, while at the same time conserving our natural lands, habitats, and soils, we can deliver up to 30% of the climate solutions needed by 2030 to tackle the climate crisis and help implement the Paris Climate Agreement.